The Eco Kraft materials we use are made from 100% recycled fibre, most of which is ‘low grade’ mechanical waste. The manufacturing process is entirely free of chlorine and the resultant papers are a very tactile, bulky brown paper and board with an ‘organic’ feel. 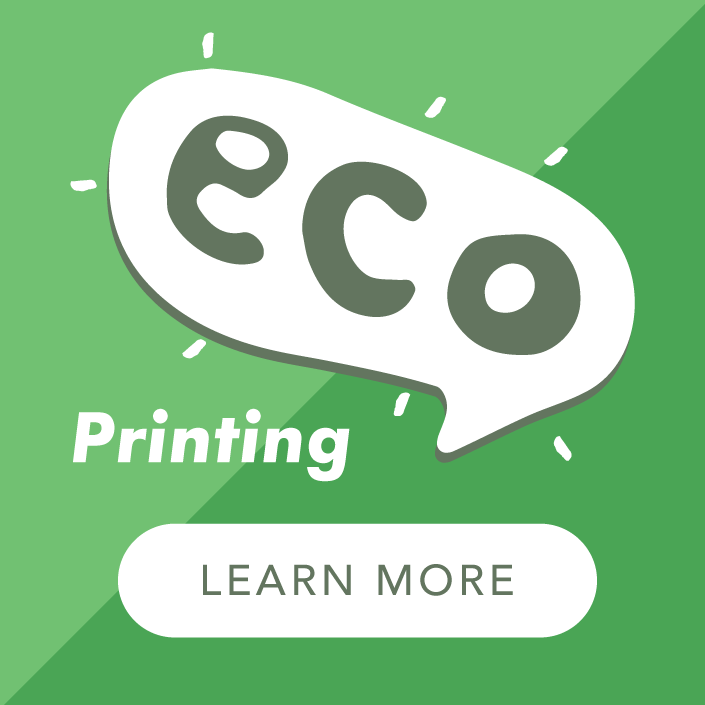 Eco Kraft is suitable for greeting cards, post cards, folders, tags, presentation items and booklet covers. 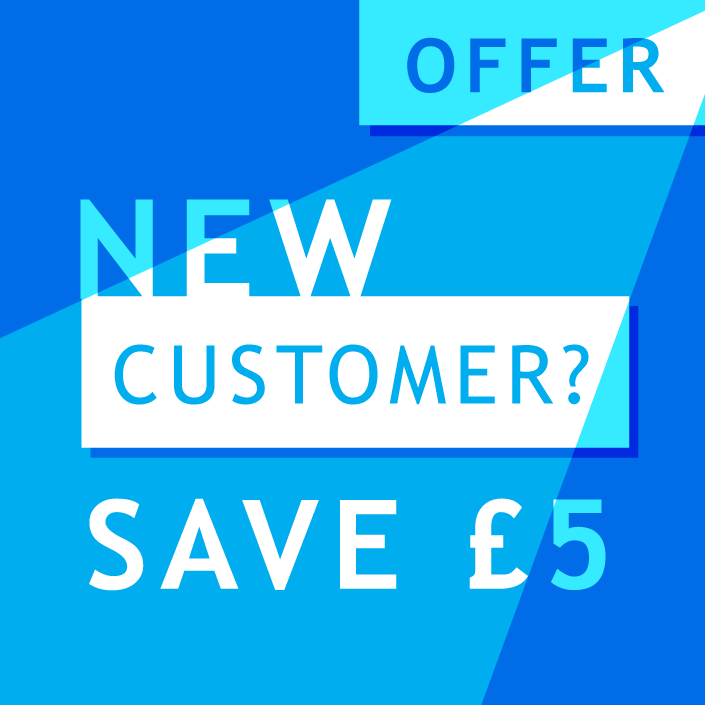 We specialise in printing on kraft and find that there are a few questions that come up more than others. 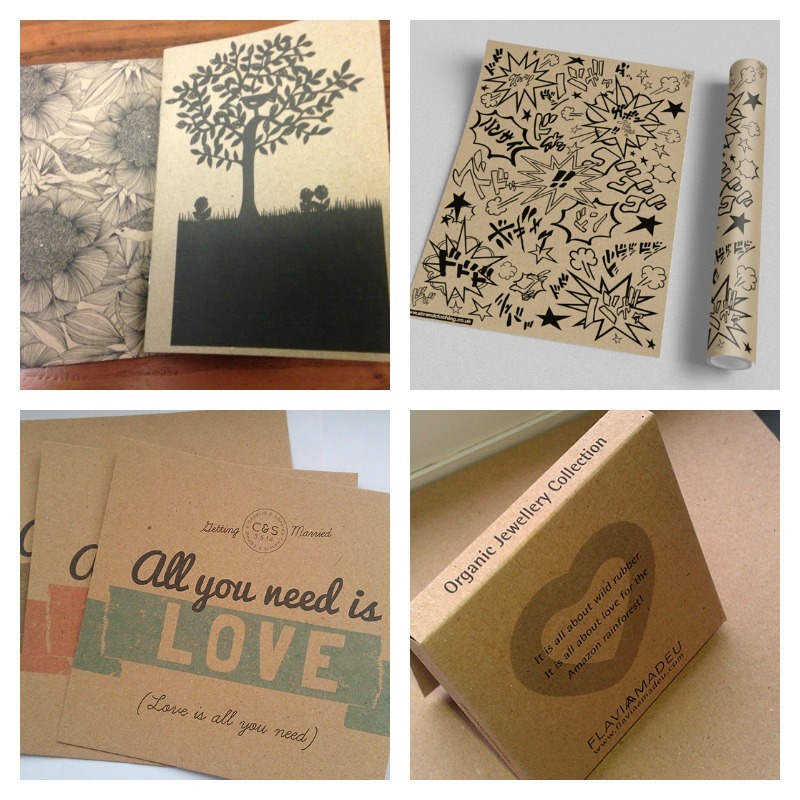 Can you print white ink on kraft paper? Although we can print a rainbow of amazing colours the one colour we do not print is white ink on kraft paper. White ink can be printed but you may need to find a silk screen printer for this special printing technique. So if my artwork file has a white background will the white area show up when printed on kraft paper? Sadly no. As litho printers any area of white within a design is created by leaving that area unprinted as we are normally printing on white board. Using the same technique with brown kraft board will leave an area of brown, not white. We also recommend that you stay clear of yellow as it will be too light to show up properly against the colour of the board. What colours will print well on kraft paper? We recommend sticking with darker colours or muted tones when printing on kraft as these are less likely to be affected by the colour of the paper they are being printed on. Natural hues work in harmony with kraft boards and black provides a great contrast on the kraft paper. Other than black all colours will be affected to some extent due to them being printed on brown board. Any colours I should avoid for printing on kraft? In addition to white and yellow we recommend avoiding pale or light colours all together as they simply don't have enough oomph to show up against the brown board. Also, kraft board is very roughly textured and absorbent with a tendency to soak up the ink like blotting paper reducing the ink strength even further. How do Neon / Fluoresent inks print on kraft? Neon inks are very thick and viscous and because of these properties sit on the kraft board rather than sink straight in. This means that in general the neon ink will retain much of its brightness. However, when printing on kraft the strong colour of the board is always going to have an effect on any colours (other than the reall dark ones) so you must be aware of this. If the vividness of the colour is a concern we recommend that you opt for a coated board, like our Silk or Premium, rathern than kraft. Forget photographic images as they really don’t work very well on kraft board. Simple line graphics in one to three colours is really the best option and will result in a product you are more likely to be happy with. On the basis that spot colours will not reproduce as per the pantone book we prefer to print out of CMYK – it gives a better colour and finish. Try to keep your design ‘clean’ - incorporating gradients into your design, for example applying a vignette, can result in an abrupt edge. Beef up your fonts - Printing on heavily textured materials causes the ink to bleed into the peaks and troughs on the material surface and can result in the text becoming 'filled in' and loosing definition. If you are printing a design with an area of reversed out text, a similar thing will happen in that the ink around the text will expand in to the area that should be unprinted; on areas of fine text the result again can be some in-fill around the edges leaving a 'hazy' effect. What are good products for printing on kraft? Eco kraft is a lovely material and ideal for a vintage, organic look and feel. It is not a thick board but is ideal for swing tags, cards, invitations and all things wedding, notebook covers, light packaging and folded products. Browse our kraft products and be inspired.